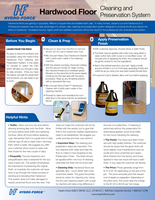 This guide contains the Hardwood Floor Cleaning and Re-Coating System on 1-side and the Tile, Grout and Hard Surface Cleaning System on the other. Order this easy-to-follow cleaning guide for each of your technicians. They will have the cleaning formulas and techniques in their own truck. Download your free copy today below.